We are like caterpillars contemplating pupation. Last weekend was one filled chores around the house. It seems many things have gone undone this fall with our hectic schedules. In putting away various caterpillar cages, floral tubes, plastic bags, and other gear associated with our many caterpillar programs last month, Melissa decided to look in the soil-filled plastic box we dubbed the pupation chamber. Every year at BugFest, we end up with several of our program specimens (often the stars of the show) deciding it is time to begin their long winter “sleep” where they form a pupa. Caterpillars tend to enter a “crawl-about” phase for several hours when they get ready to pupate and, if you don’t contain them, they will wander off their host plant (not a good thing if there are thousands of human feet attending an event). Most of our common species of butterflies and moths spend the winter in this life stage and usually emerge sometime next spring or summer, depending on the species. 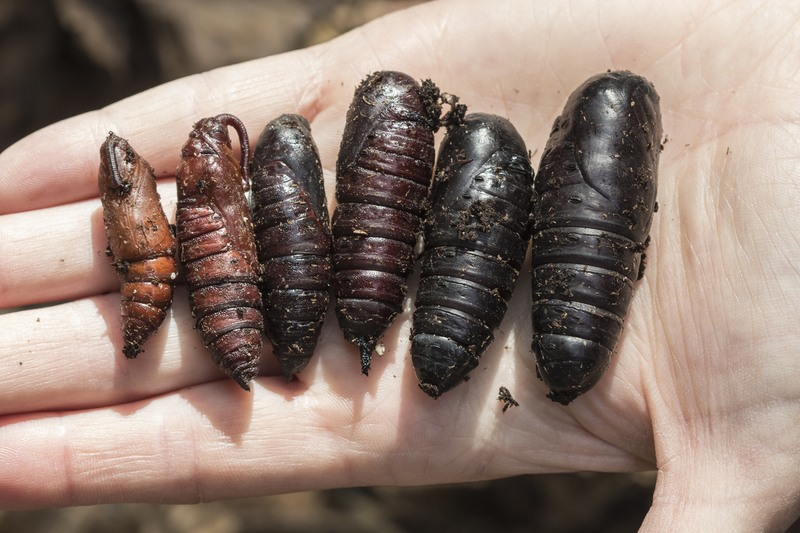 We were pleasantly surprised at the number and variety of pupae in the soil-filled box. Before looking more closely at these pupae, a quick review of the terminology associated with the pupae of butterflies and moths. A pupa (Latin for doll) is a life stage of some insects. It is found only in insects that undergo complete metamorphosis – those that go from egg to larva to pupa to adult. The pupa is a non-feeding, usually stationary stage (although many pupae will move or twitch when disturbed). 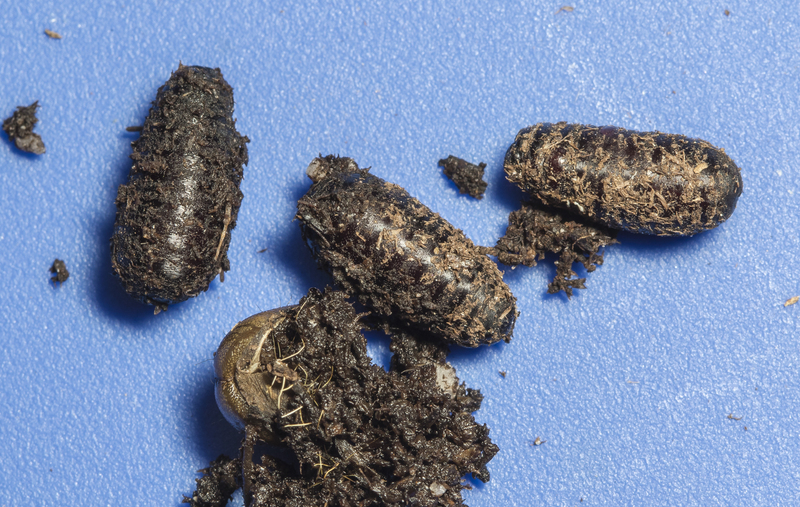 During pupation the adult structures of the insect are formed while the larval structures are broken down. While use of the word pupa is correct for any insect with this life stage, there are some special terms often used for the pupal stages of different groups of butterflies and moths. A chrysalis is the “naked” pupal stage of butterflies. The word is derived from the Greek word, chrysos, for gold, and refers to the metallic gold coloration found in some types of chrysalises. The chrysalises of most butterfly species are attached to a substrate by a single silk pad. 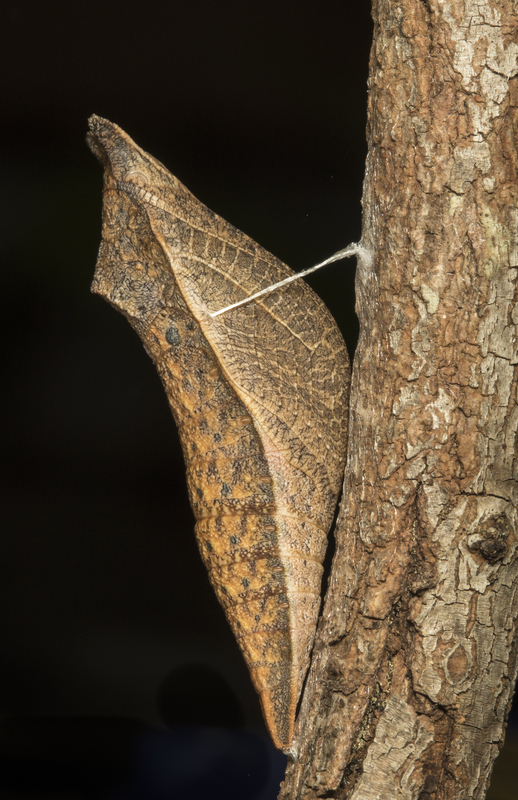 Members of a few butterfly families use two attachment points for their pupae – the silk pad at the posterior end, and a silken girdle that suspends the chrysalis off of a substrate (looking much like a telephone repairman’s safety harness). A cocoon is a pupa wrapped in an outer casing of silk (and often other materials) that acts as a protective covering. Many of the giant silk moths, such as a luna moth, incorporate leaves into their cocoon. 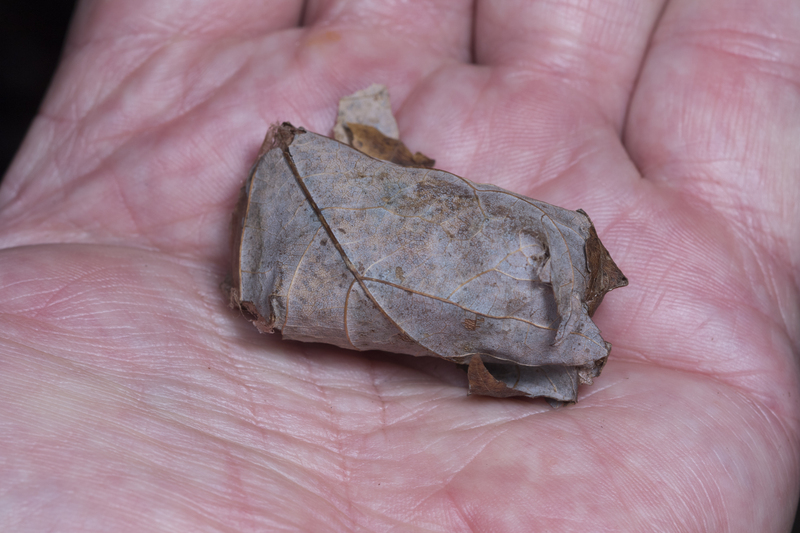 The last instar of the caterpillar wraps some leaves around itself using silk, and then molts one last time on the inside of this chamber to form the pupa. 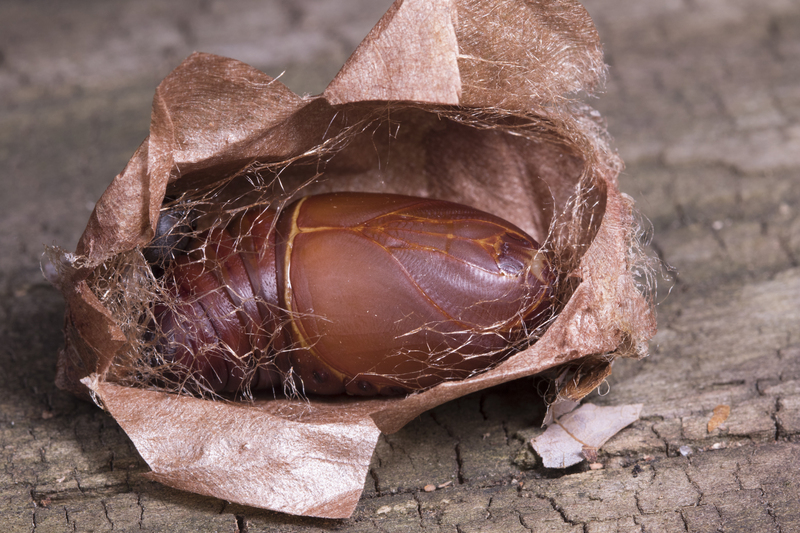 If you look inside a cocoon, you will see the familiar brown or reddish-brown cylinder-shape of a pupa (if done gently, the adult moth can still successfully emerge from an opened cocoon). The silk from a giant silk moth cocoon can be unraveled to harvest silk fibers on a very small scale (commercial silk production uses the cocoons of the domesticated mulberry silkworm moth). If you are an insect that creates a cocoon, you need to have a way to escape from it as an adult. Most species do this by either cutting their way out or by secreting enzymes that soften the cocoon. Some cocoons are constructed with one-way escape holes or with lines of weakness that allow easier escape from the inside. The classic pupa is “naked” and is formed by a moth caterpillar in an underground chamber or some partially hidden location (under a log or rock, in loose soil, etc.). 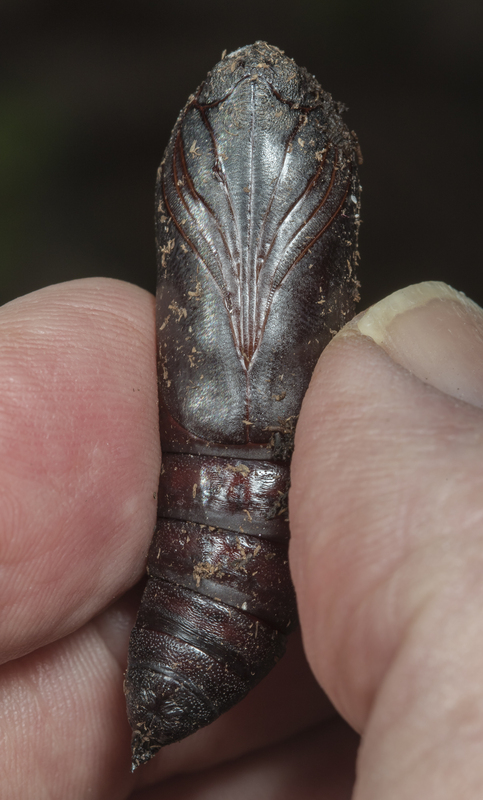 They are often encountered while digging in your garden and resemble little cigar butts. In a nod to this month’s unique holiday of all things scary, moth pupae also remind me of miniature mummies. 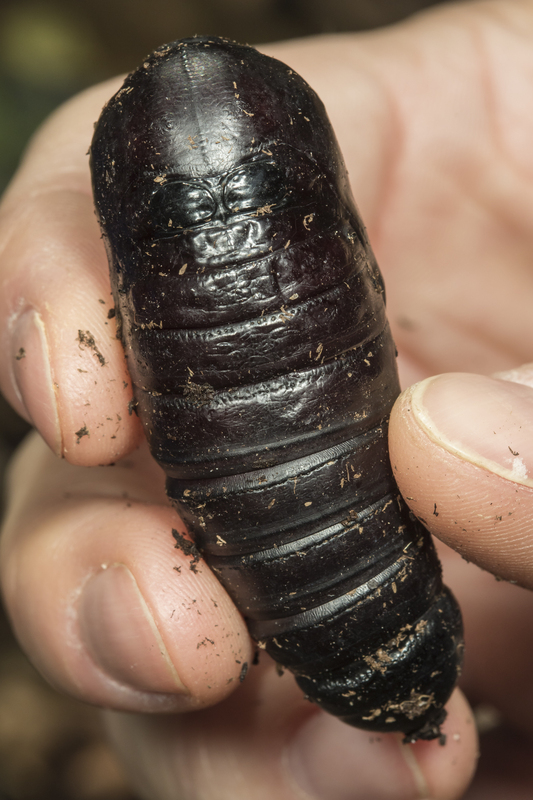 The size of the pupa and associated structures can help you identify these mystery creatures. 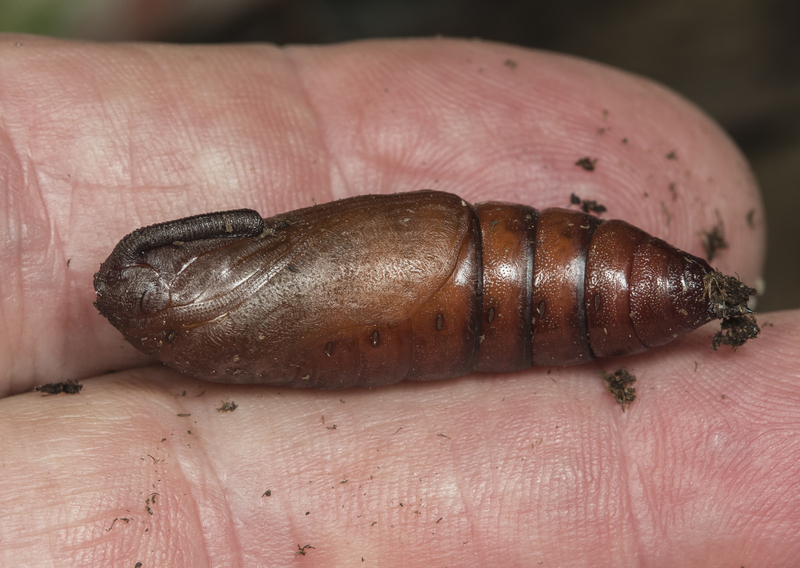 Large pupae (greater than 1.5 inches) usually belong to either the sphinx moth family or are one of the giant silk moths. The largest (about 2+ inches) we encounter are those of the fantastical hickory horned devil. The last instar caterpillar burrows into the soil and forms a crusty chamber around itself before pupating. 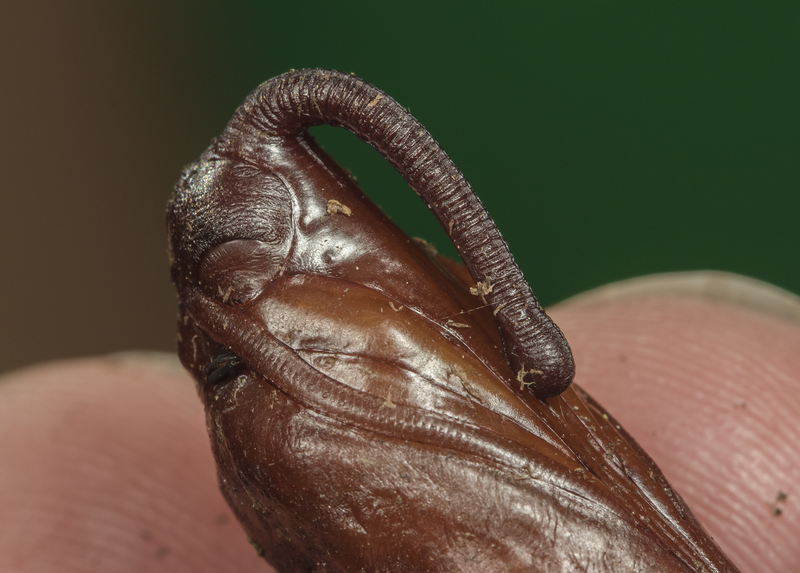 The pupa is shiny dark brown and has a couple of dark circles on the back of its head that give it a Darth Vader appearance. This pupa had the characteristic double-tipped projection at the end of the abdomen indicating it is an imperial moth. 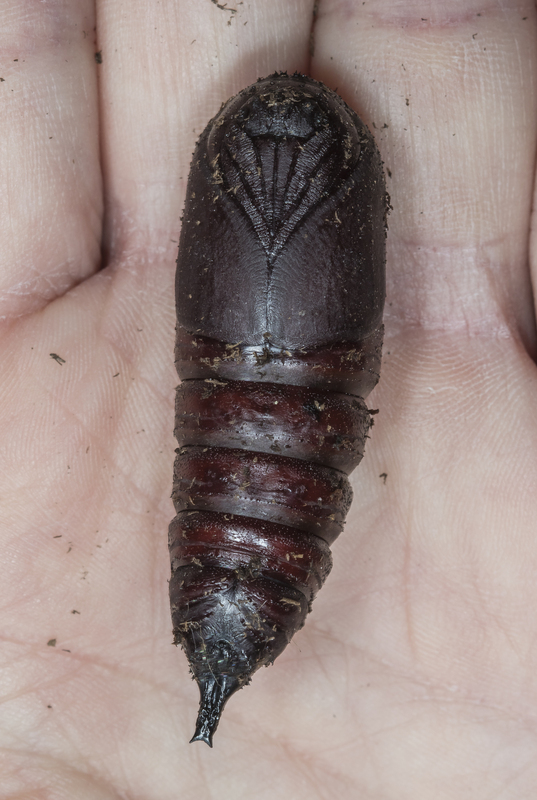 The identity of one of the pupae remains a mystery as it is tough to remember which species were added to the chamber on a busy day of programming. Sphinx moth pupae generally have a distinctive “handle” on their heads. This fishhook-looking apparatus is actually a sheath that contains the moth’s developing proboscis (tongue). You can also clearly see the developing eyes and antennae of the adult moth in the pupal covering. 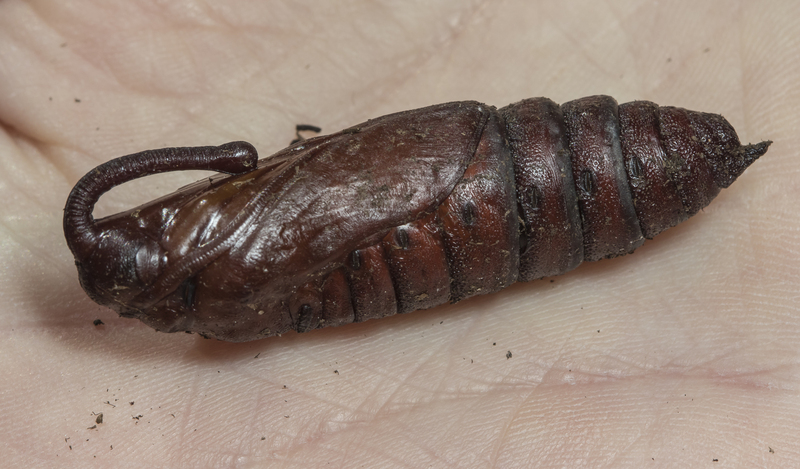 We found another sphinx moth pupa in the chamber that differed from the tobacco hornworm in that the proboscis sheath did not arch out away from the moth body but rather was laid flat against it. We had many species of hornworms this year, so we will just have to wait and see which one emerges. Our smallest discovery was one we weren’t very happy about – some fly puparia. These are probably a species of tachinid fly that are parsitoids on the larvae or pupae of butterflies and moths. We placed these is a separate container to see what emerges. Observing the life cycles of our wild neighbors always leads to additional stories and connections that continue to amaze and delight. Can’t wait to see what happens next spring and summer. 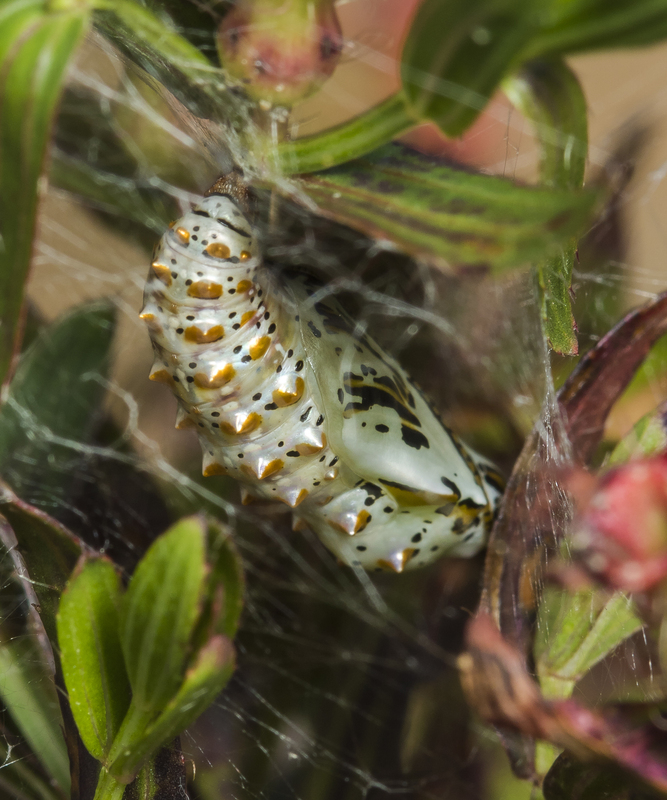 This entry was posted in Natural History and tagged chrysalis, cocoon, pupa by roadsendnaturalist. Bookmark the permalink. astounding details in these photos, quite beautiful! Thanks, Mary. These things are beautiful, yet so strange. The designs and colors are so rich. Loved seeing these photos.